Beta release 69 of Chrome became available a few weeks ago. For IT admins, this brings some changes to what's supported by the browser as we work towards offering a more stable and secure web experience for all users. Need to manage these changes? We have policies to help you do that. We're also making new security capabilities and usability enhancements available that make Chromebooks even better for business users and IT. Check out the release notes for more information. In the meantime, here’s a rundown on a few of the new features in Chrome Enterprise 69. In December we announced we’d be implementing changes to increase stability, including blocking third-party software from injecting code into Chrome. In Chrome 69, third-party code is now blocked by default. If you still use software that injects code into browser processes and need to temporarily enable access, you can designate these apps with the new ThirdPartyBlockingEnabled policy. Last year, Adobe announced it will stop updating and distributing the Flash Player at the end of 2020. As part of our transition plan, starting in Chrome 69, sites using Flash will require users to grant explicit permission to run every time they restart their browser. This change won’t impact enterprise settings—you can continue to use DefaultPluginsSetting, PluginsAllowedForUrls, and PluginsBlockedForUrls policies to configure Flash behaviour as before. Only user-configured settings will be impacted. This is part of the overall path to Flash removal from Chromium, per the Flash roadmap. Enterprises using Flash applications today should be looking for alternatives to those applications. Password Alert has been a popular extension with enterprises for the past few years that protects Google Accounts. With the release of Chrome 69, we’re adding password alert as a policy to Chrome Browser that allows IT to designate corporate accounts, both Google and non-Google, where password protections will be put in place. If your users input their passwords on websites that aren’t whitelisted by your organization, or on dangerous websites, they’ll get a full-page warning that prompts them to reset their password. Preventing password reuse across multiple websites can protect your organization from compromised accounts. Voice-to-type has been available on Chromebooks for some time through the on-screen accessibility keyboard or the virtual keyboard’s microphone icon. However, many of our users have asked us to make dictation a standalone feature separate from the accessibility keyboard. Chrome 69 now offers dictation as a separate accessibility feature. With dictation enabled, a small button will appear in the status area. When focus is in an edit field, users can either click the button to start dictating or press the keyboard command Search + D, then use their voice to input text. To reduce eye strain and improve sleep, Night Light on Chromebooks lets users manage the color of their device displays throughout the day. Users can use a preset sunrise/sunset schedule and suggested tint. Or, they can customize their daily schedule and color temperature from a spectrum of colors. 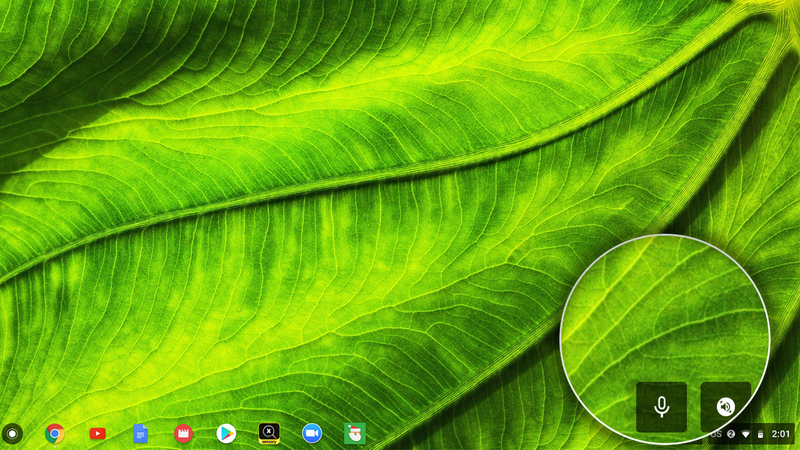 Linux for Chromebooks, in beta, allows developers to use their favorite editors and command-line tools by adding support for Linux apps. By turning on Linux in Settings, you can get a Terminal app in your launcher and install any apps or packages from there. The apps will be securely sandboxed inside a virtual machine. By default, enrolled devices have virtual machines disabled, so Linux for Chromebooks is currently only supported on a select range of unenrolled devices. Policy support to enable this on enrolled devices will be coming in the future.